Virtually everyone has--or will--face crises of life and faith. These pivotal times are part of everyone's spiritual journey. Why then do some people emerge from the crisis with their faith intact while others give up on God, the church, and holy living? If God Disappears comes alongside the Christian who is spiritually drifting--or is on the verge--or knows someone who is considering leaving God and the church behind--and compassionately empowers them to re-embrace their faith. Author David Sanford shares nine "faith wreckers" and nine "faith builders" to help us better understand which circumstances and attitudes undermine our faith and which ones draw us closer to God. David and Renée Sanford own Sanford Communications, Inc., which works closely with leading authors, ministries, and publishers to develop life-changing books and other resources. Their professional credentials, life experience, and passion for helping adoptive families make them well-qualified for this project. David, Renée, and their two youngest children live “on the road to Damascus” a few miles from downtown Portland, Oregon. Sometimes it takes the experience of losing someone to shake us out of complacency. I lost someone when I was eleven. My dad and mom and brother and two sisters and I were near Snoqualmie Pass, about fifty miles east of Seattle. Waiting in line near the top of the mountain slope was a girl about my age with a new, red snow saucer. Compared to my black, smelly inner tube, it was high tech. I’d never seen anyone fly so fast down the mountain before. I continued to watch the girl as I made my own way down at less than breakneck speed. Most kids stopped shortly after the slope flattened out. But this girl just kept going and going. And then she disappeared. I swung around quickly to my left, to my right. Everyone around me was getting up and trudging back up the hill. But I didn’t see the girl. She had been right in front of me. And then she was gone. Still no one believed. Except me. The snow was wet and heavy that day. Off the beaten track, I soon found my boots sinking deeper and deeper into the snowpack. It took a full minute to cover ten yards. But I would not stop. Looking carefully, I could see the slight depression where the girl’s red saucer had flown across the surface of the snow. Scattered alpine trees stuck out of the snow just ahead of me. I looked back and realized I was well off the beaten track. But I knew I had seen the girl go this far. My heart stopped when I found the dark hole. There, in front of me, the saucer’s track stopped. I didn’t have time to go all the way back up the slope to my parents, so I accosted the first adult I found and breathlessly told him my story. He started yelling, and other adults came running. Someone called up the slope, and within minutes someone else was running toward us with a rope. I led everyone along the path I had taken earlier. It took a while, but eventually a very wet and cold girl was fished out of the creek fourteen feet below the snowpack. She was reunited with her father, and all was well again. For a long time afterward I pondered what would have happened if I had been the one riding the red saucer. I also wondered why it was so hard to get anyone to believe me. The fact is, sometimes the bottom does fall out from under us, God seems to disappear, and it’s almost impossible to get anyone to believe us. What’s yours? Have you ever reached a point in your life where God seemed to disappear? Have you ever felt as if things couldn’t get any worse? As if someone has turned out the lights and God just slipped away? Martin Luther called this Anfechtung. Saint John of the Cross called it the “dark night of the soul.” Only it doesn’t usually last a night. It can last for days. Weeks. Months. Even longer. And when God steps back into the picture, it often feels too late. Throughout literature, music, and movies, we see the themes of God’s (or gods’) abandonment, the hero(ine)’s resultant agnosticism, and the immense struggles that ensue. In real life, there’s not always a happy ending. Just when Lois thinks she’s completely processed her pain and suffering, she faces a second crisis: Can she make room in her life for Superman again? Like the shaken believer who feels that God walked away without even waving good-bye, Lois has to decide: Does she even want him back? We all need to answer that question at some point. Do I want God back? This is the central question to those who feel God has walked out on them. Everyone has faced—or will face—such crises of faith. For some reason beyond our human understanding, such crises are part of everyone’s spiritual journey. Of course, Superman did return to Lois. But for Christians, sometimes it seems impossible to wait when we have no idea whether or not God is ever coming back. In the darkest times—the death of a close friend or loved one, a horrible accident, acts of terrorism and war, natural disasters, and other tragedies—he seems infinitely far away. When I was nineteen, a close family friend, Darrell, fell victim to intense headaches. A CAT scan technician first spotted the problem: a massive tumor. Brain surgery followed. Darrell was practically my adopted brother, so I visited him every day. The first day he looked pretty roughed up, but the nurses said he was doing fine. As is customary after such surgeries, they were checking on him every thirty minutes, which was reassuring. The second day Darrell looked about the same. The third day his bed was empty. His mother stood in the corner of the room, weeping. Two hours earlier, the nurse on duty had been in to check on Darrell, only to discover he had stopped breathing. The hospital staff rushed to revive him, and now was desperately fighting for his life. Darrell’s mother looked up as I entered the room. Seven years earlier, her first husband and oldest son had died in a tragic boating accident. She then married Darrell’s stepfather, but two years later, he had a fatal heart attack. Now this. She looked down to her right. I’m not even sure she was talking to me. If she was, she certainly wasn’t expecting me to say anything in reply. She was absolutely exhausted. The attending physician came into the room and said there was nothing more they could do. Still in shock, Darrell’s mother left. The doctor took me to Darrell’s room in ICU. For three days, I stayed with Darrell. I talked with him. I stroked his hand. I pleaded with him to let me know he was still there. I desperately looked for any sign of life. After three days, they turned off life support. I never realized how powerless I was until that experience. Not only was I unable to save my friend, but I also had nothing to say to his mother in her moment of deepest grief. Where was anyone when Darrell’s mom and I felt overwhelmed with such intense feelings of loss and grief? Who could blame her or me for feeling abandoned? Sarah’s hard-driving husband, Rob, wasn’t a kind man. Twenty-six long years had proved that beyond a doubt. Day after day, night after night, Sarah prayed for Rob to find God and turn his life around. But the years had taken their toll, and most of the time Sarah found it to be almost a relief when Rob left the house to go to work. She couldn’t remember the last time he had told her goodbye, let alone offered a kiss. That morning was no different, it seemed. Until a knock at the door shortly before lunch. Rob had been headed north on I-5 just outside Sacramento when a semi jackknifed in front of him. A second semi and Rob’s hotel shuttle van hit simultaneously, rocketing him out of the vehicle. Seventy five yards away, he writhed in unimaginable pain. By the time the paramedics arrived, he was almost dead. He officially expired at 10:33, less than two miles from a local hospital. That day, Sarah experientially lost her faith. She had prayed and prayed for her husband’s salvation. Where was God when her husband needed him most? And where was God in the midst of her piercing sorrow? A year later, Sarah answered the phone and a woman asked if her husband had been in a terrible accident. Sarah demanded to know who was calling. The woman said her name was Tammy. She had been driving south when she witnessed the accident. Instinctively, she pulled off the freeway as quickly as she could. In the median someone was dying. She couldn’t bear to look. Gripping her steering wheel, she argued with God. Go to him, God told her. I can’t, Tammy argued. My two children are in the backseat, bundled in their car seats. Weeping, Tammy pulled the key out of the ignition, looked back at her sleeping children, stepped out of the car, made sure all the doors were locked, saw that traffic was at a complete stop, and started running between cars toward the median. She knelt in the grass amid the broken glass, took the man’s bloody hand, and started talking to him. Immediately, he stopped writhing. He couldn’t speak aloud, but he slowly shook his head no. “Pray with me,” Tammy told him. When she finished the prayer, Rob squeezed Tammy’s hand. “Did you pray with me?” He squeezed again. Sarah told me the same thing. After all the depression and anxiety and stress she’d experienced, her life felt shattered. To this day, she believes God might as well stay put in heaven. She’s not looking for him anymore. At least not yet. But God hasn’t given up on her. Neither have I.
It’s startling to realize the implications of God’s unconditional love, grace, and mercy. Like the Prodigal Son’s father, God isn’t disillusioned with us. He never had any illusions to begin with. Of course, even if someone knew God wasn’t angry at her, if she knew beyond a doubt that God had no intention of heaping guilt or shame on her, there’s no guarantee she would turn back to God. I walked away, didn’t I? I made my choice. My fate is sealed, isn’t it? The course of your life could change today based on a single decision you’ll make—either to open the door of your heart and invite God to come back in or to consciously lock him out of your life forever. Maybe you have been taught that it’s impossible to come back to God. You may have felt God wouldn’t take you back anyway. But it’s not too late. Right before the start of World War I, a young French boy named Jean-Paul Sartre and his widowed mother were living with her parents. The grandfather was a Protestant, the grandmother a lifelong French Catholic. At the dinner table, the family patriarch and matriarch often poked fun at the other’s religious beliefs. By the time the war ended, Jean-Paul had grown completely disenchanted with the church. By the time he turned twelve, he thoroughly hated to attend Mass and resolved that he would go no more. To seal his decision, Jean-Paul stood before a mirror, stared at his reflection, and then cursed God. He felt a sense of relief. He was through with God and the church. He decided to become an atheist so he could live the rest of his days as he pleased. In other words: If I really meant it when I cursed God, I thereby set the course of my entire life and have sealed my fate. Sartre went on to make a name for himself, of course. His political exploits are legendary, his writings definitive of mid-twentieth century atheistic existentialism. Yet, reviewing his life, Sartre seemed to swing between the extremes of heady pride and sexual liberation on the one hand, and philosophical anguish and personal despair on the other. On numerous occasions, Sartre stated that there is “no exit” from the human dilemma of trying to live as if God did not exist. “Man is alone,” Sartre claimed, abandoned to his own destiny. “Hell is other people.” Life is hard, and then you die. Period. My friend Tim Barnhart says, “He was trying to experience life on his own terms. His ‘truth,’ though depressing and controversial, was nonetheless an exercise in believing.” I agree. How tragic that Sartre allowed a decision in his youth to overshadow any consideration of God’s relevance for nearly six decades. Although he’s considered one of the greatest twentieth-century philosophers, I believe Sartre committed two of this past century’s most prevalent errors of thinking. First, Sartre confused his feelings with reality. You see this all the time. A man wakes up one morning, rolls over, sees his wife, and realizes he doesn’t have any loving feelings for her. This lack of feelings of love shocks him so much he decides it must be the truth. So he acts accordingly, forgetting that love is more than a momentary feeling. In reality, to love is a decision we make over and over again. I don’t know your particular life story. Yet after talking individually with hundreds of people over the past decade, I find that many people wish, in their heart of hearts, that they could believe God hasn’t abandoned them after all. God wants us to know that even when it’s humanly impossible to see or feel him, he is always there with us. Sometimes that’s hard to believe. But no matter how deeply we bury grief in our souls, it doesn’t go away. Four years ago, Lisa and her family took a brief but much needed vacation at a beautiful resort outside Phoenix. During their fifth night there, Lisa was awakened by a horrific nightmare. She dreamed she was a little girl again, just four years old. Her father was tying a gag in her mouth and then binding her hands. While her mother watched, he carried her through the apartment and down the stairway to a waiting car. He put her in the trunk of the car and slammed the lid shut. Lying in the dark in her hotel room, Lisa trembled in her bed, perspiring all over. Never had she felt such an overwhelming sense of shock, fear, and abandonment. She couldn’t stop the unfolding nightmare. She turned on the light. She wept. She cried out to God for deliverance. Finally, in desperation, she woke her husband, Mark, beating his chest as the nightmare continued to play out in her mind: The four-year-old Lisa was drenched with sweat by the time the trunk lid opened again. She was slapped, then carried into what appeared to be a warehouse. Except for the light from a small wood fire, it was dark inside. Lisa’s captors laid her next to the fire, only inches away. She tried to roll away, but they kept kicking her back. Finally, when her clothes were almost dry, they forced her to stand up and then stripped her. Then they started filming the unspeakable atrocities that happened next. What Mark didn’t realize that night was that his own nightmare had just begun. It would be months before Lisa was finally diagnosed with dissociative identity disorder, and by that time, her four-year-old self was often Lisa’s dominant personality. She no longer knew anything about God, her Christian faith, or even her husband, often emphatically declaring that she wasn’t married to him. Months later, having no idea what had happened, I sat in Lisa and Mark’s living room, expressing my genuine concern for their welfare. Thirty-year-old Lisa looked at Mark, nodded her head, and then looked down for a minute. I sat quietly. Finally, her story—their story—started coming out. I immediately quit asking questions. When someone tells their story, I’ve learned to listen—just listen. I’m convinced that intertwined within every story you’ll find God’s redemptive presence where you least expect it. As Lisa told her story that night, she began to see God again for the first time in a long time. She wept tears of joy as she felt his presence. She realized he was in the midst of her story, after all. The next morning Lisa called to tell me she had slept through the night for the first time in sixteen months. By week’s end, four-year-old Lisa had begun reintegrating with thirty-year-old Lisa. She still had a long road of healing ahead of her, but the process of recovery had begun. Today, her marriage and faith have been fully restored. I say that almost matter-of-factly, but for a long time that was anything but a sure thing. Like Lisa, we all have a story. But unless we’re broken enough to take the terrible risk of telling someone our story, no matter how dark it is, we may never reconnect with God again this side of eternity. Remarkably, as Lisa learned, if we do tell our stories to someone who knows God—without demanding answers to that blackest of all questions (“Why?”)—guess who shows up, unannounced? As a teenager, I must have read through the Psalms a dozen times each year after my father’s health fled and poverty pounced upon our once-proud family. I learned firsthand that God indeed cares deeply about the helpless and oppressed, the wounded and despairing. Perhaps more than any other portion of Scripture, the Psalms tell us about real life. Over and over again throughout the Psalms we find the psalmist crying out to God in various dire circumstances. I have so many enemies! Listen to my cry for help. Go away, all you who do evil. In seven out of every ten psalms, the writer is crying out to God for physical salvation, thanking the Lord for sparing his life, reminding himself of the differing fates of the righteous and evildoers, or renewing his allegiance to God and his Word in the face of rampant wickedness. During my teens, as my dad lost his eyesight and the financial pressures on our family became increasingly severe, I was driven again and again to the Psalms. Over time, I memorized nearly fifty of them. They renewed my faith in the God of the afflicted and suffering. Maybe you haven’t thought much about the Scriptures for a long time. Yet if the middle of the Bible teaches us anything, it’s how to turn to God in times of trouble and pain. I invite you to consider this brief synopsis with specific examples from various psalms. ■ Call out to the Lord . . .
O God, listen to my cry!
. . . and ask for help! ■ Tell God about your troubles . . .
and made Jerusalem a heap of ruins. . . .
. . . and admit if you feel abandoned or forsaken. O Lord, how long will this go on? Will you hide yourself forever? ■ Describe what you want God to do . . .
Give us gladness in proportion to our former misery! Replace the evil years with good. let our children see your glory.
. . . and explain why God should act on your behalf. ■ Give a candid appraisal of your enemy . . .
. . . and ask God to put that foe in his place. Arise, O Lord, in anger! Stand up against the fury of my enemies! ■ Honestly evaluate your guilt or innocence . . . I cling to your laws.
. . . and confess any known sins. ■ Affirm your implicit trust in God . . .
. . . and then praise God for his deliverance. who did not let their teeth tear us apart! We escaped like a bird from a hunter’s trap. The trap is broken, and we are free! If we learn anything from the Psalms, it’s that God isn’t afraid of our emotions, our struggles, and our questions. The one mistake we dare not make, Philip Yancey reminds us, is to confuse God (who is good) with life (which is hard).5 God feels the same way we do—and is taking the most radical steps possible (Christmas, Good Friday, Easter, and more to come) to redeem the present situation. I haven’t always believed that. In fact, my father is an atheist. I was raised to not believe in God. When I became a Christian, my dad saw it as an act of rebellion. Later, I studied under a German existentialist philosopher. I dared her to prove there isn’t a God. “If you’re right,” I said, in essence, “I’ll stop being a Christian.” Instead, after studying the writings of the most renowned atheists of the past four centuries, my Christian faith was stronger than ever. Why is it, I wondered, that these men and women can write brilliantly about any area of philosophy, but they get so angry and irrational when writing about God, the church, and the Christian faith? After studying their biographies, I discovered the most common reason: Very bad things happened to them or their loved ones, often when they were very young. Many even went on to study in seminary, but they didn’t find the answers they were looking for. So they turned against God with a vengeance. It can happen to any of us. A decade ago I was hit with a rapid-fire series of crises. Emergency surgery for my oldest daughter, who had just been diagnosed with endometriosis, a painful, cancer-like condition. Unexpected house repairs. Two vehicle breakdowns. Huge unpaid bills. I felt that the hand of God was crushing me—emotionally, physically, financially, and in every other way. How could God do this to my family? My love for God, my joy for life, and my peace were shattered. Instead I felt angry, deceived, and desperate for a way out of my family’s nightmare. In my despair, I doubted God’s character. Finally the day came when I couldn’t read the Bible anymore. Not a single verse. I couldn’t pray, even over a meal. For days and weeks on end. Experientially, I had lost my faith. Why? Because I had let the circumstances of life temporarily overshadow what I knew to be true. As a result, I couldn’t fall asleep at night. I couldn’t get rid of the stabbing pain in my chest. Finally, like Peter the apostle at the end of John 6, I realized, “Lord, to whom would we go? You have the words that give eternal life.” I dared take the risk of embracing faith again. Thankfully, God renewed my faith when I started taking several simple (but nonetheless terribly hard) steps of obedience. I forced myself to open my Bible, read a verse—I don’t even remember which one—and honestly answer the question, “Do I believe it?” To my surprise, I said yes. It wasn’t a big yes. But it was enough to prompt me to read another verse, and then another. At long last, I felt God speaking to me again. I started praying to him as well. To my surprise, he wasn’t angry at me over my crisis of faith. Just the opposite. In time, my faith was renewed in a remarkable way. Since then, I’ve talked with many people about my experience. Not because it’s dramatic, but because it’s true to life. Every Christian is seriously tempted, at one time or another, to lose his or her faith. The good news is that God never abandons us. Even in the worst of circumstances, he’s still there, urging us not to lose hope that we will see him again. What’s your story? Can you see God at work in your life? If not, let’s talk. 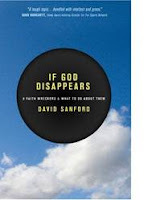 You can write to me at IfGodDisappears@gmail.com. 1. See http://www.americanbuddhist.net/general/thought-0?page=6 (viewed October 25, 2007). 2. This statement originally appeared in French in Nouvel Observateur. It first appeared in English in National Review, June 11, 1982, 677. 3. Luis Palau and David Sanford, God Is Relevant (New York: Doubleday, 1997), xi-xiii, tells Jean-Paul Sartre’s story in more detail. 4. If, like Lisa, you long for healing from the wounds of child sexual abuse, I highly recommend In the Wildflowers produced by Restoring the Heart Ministries, www.rthm.cc/Wildflowers. 5. See http://www.csec.org/csec/sermon/yancey_3302.htm (viewed June 1, 2008).